Frank Jacobs and his team at Cologne company mft developed an innovative water treatment plant for a Columbian village in La Guajira. The company Membran Filtrationstechnik GmbH (mft) develops and produces water treatment plants. The Cologne-based company mft was founded 21 years ago and today has 20 employees. With its water treatment plants, it is active in more than 100 countries. Commercial director Frank Jacobs (photo above) has been working with mft since 2013. Mr Jacobs, how much clean water should be available for one person every day? In Germany we ideally need around 120 litres a day. Unfortunately this is a utopian amount in South America. Much of the treated water seeps away in dilapidated distribution networks. What's even worse is that many people there also use untreated river water and become ill.
What is the situation in La Guajira? Even though this province is on the coast in the northeast of Columbia, it is very dry there. The local residents, many of whom are indigenous, are poor and suffer from a lack of water. As a result of climate change, Columbia is experiencing more extreme weather conditions which are gradually destroying the obsolete water infrastructure. There is little chance in the region of access to drinking water suitable for human consumption. We chose this location after talking to Columbian politicians. 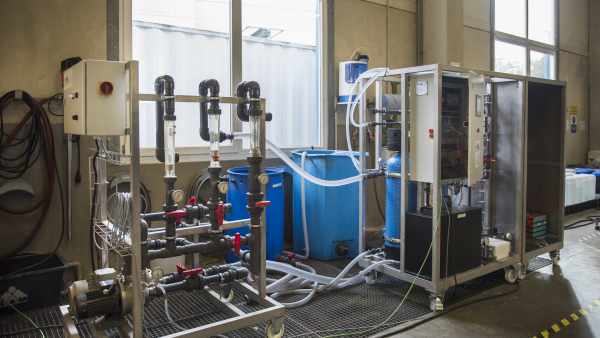 Water treatment plants like "RO Sea 100" are used to convert sea water to drinking water. Our video explains how the system works (KfW Group/bp Content). This project is new territory for us. It combines a social mission with a completely new technological development. We developed a water treatment plant with many advantages: it generates its own electricity, it is easy to maintain, it can be monitored from around the world via a data cloud and it provides people with excellent drinking water at very affordable prices. Who pays for the project? The development costs were around EUR 400,000. KfW subsidiary DEG provided more than EUR 200,000 in funding for the project from resources of the International Climate Initiative of the Federal Ministry for Environment, Nature Conservation, Building and Nuclear Safety. It is set up as a research project until 2018 at which point the technology will be ready for series production. With this prototype design for "RO 100 Sea", mft tested the functions of the new system in Cologne. Water was intentionally salinated for the test. Sounds like a miracle machine. Our new "RO 100 Sea" system that is currently on route to South America by ship will soon supply 250 villagers with ten litres of drinking water per day. "This is the absolute minimum, no more. It is intentionally a small system because it can be built this way independently of an external power supply. The water is treated based on the principle of reverse osmosis which requires electrical energy. Electricity is the biggest cost factor. A small system like ours needs four to seven kilowatt hours to treat 1,000 litres of water. As a result, we have also equipped it with its own energy recovery system. La Guajira may be poor but it has enough sun and wind. According to the United Nations, 663 million people do not have access to clean water. According to UNICEF figures, 360,000 children die every year due to germs in contaminated water, more than 40 percent of them from diarrhoeal diseases. Everything works without the electricity grid? We have integrated a connection in case of emergency so that the residents don't have to do without drinking water if the system's own power supply fails for whatever reason. The data of the system is also transmitted via a mobile communications card. This makes it possible for us to see in Cologne how the system is doing. How the weather is, how much electricity is being provided by wind and solar power, how much water is being produced and what its current purity level is. If the quality falls below a limit, the system switches off automatically to prevent untreated water from being supplied to villagers. We can also even access parts of the system from Cologne. The first stage is a multimedia filter. This contains several layers of sand with different grain sizes that filter out the large particles. The second step is a microfilter. This prevents foreign matter from getting into – and damaging – the system. The fine filtering takes place in the third cleaning step. 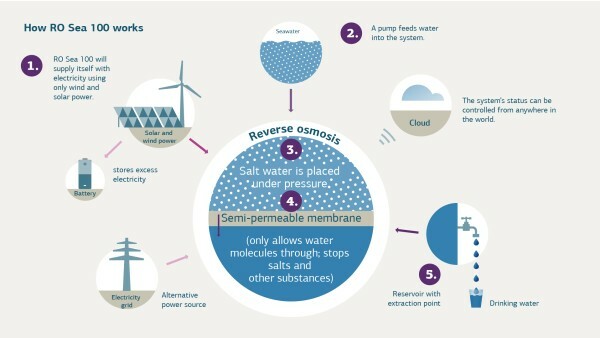 During reverse osmosis, molecule-size materials are filtered out. This includes bacteria, germs and fungi. The difference in the water quality before and after is impressive. With the membrane technology that we use, we can even guarantee that the water is germ-free. Read more under the infographic. We train people locally and in Cologne who will later look after the system. This maintenance is very important. If maintenance work is not performed, the machine may only work for a short period because no one feels responsible for it. Even a small operating error can cause problems. In another project in Madagascar, one of the people responsible put a water intake hose in a mud hole. The machine was blocked within 20 minutes and couldn't be used anymore. 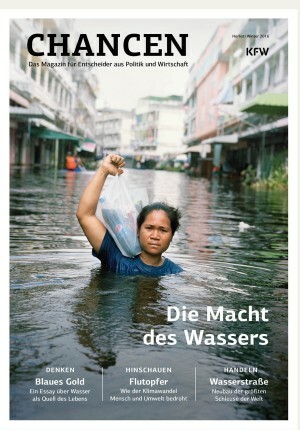 This article has been published in CHANCEN, autumn/winter 2016, "The power of water". Are there already other plans? 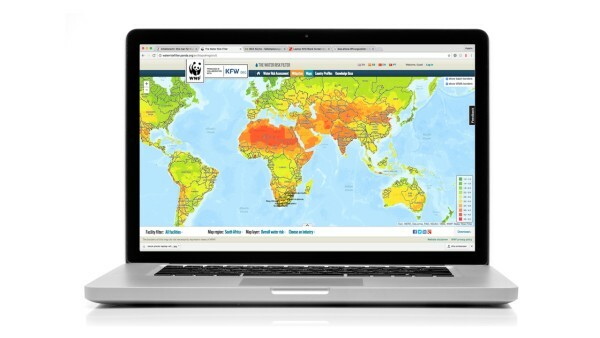 Our goal is to operate a large number of connected drinking water systems solely with clean electricity over the medium term and control and monitor them digitally. There are also a lot of ideas we could try out. If the energy unit produces more electricity than we need for water treatment, we could also offer electricity. People could also recharge their mobile phone batteries when they get water. The treated water is to be provided at fair prices locally to as many people as possible. One central question for us is whether local politicians will cooperate. Therefore, we chose a location at a school so that we can reach a lot of people. We are hopeful, as at the moment the Columbian government is working on a new law for water supply. Possibly, projects like ours help raise awareness about the issue. The Canadian author and activist Maude Barlow fights, on numerous fronts, for more water justice. Chief Economist of KfW Jörg Zeuner talks to the holder of the Alternative Nobel Prize about ways to implement the UN human right to water. For a long time, Lake Managua was considered the largest cesspool in the world. 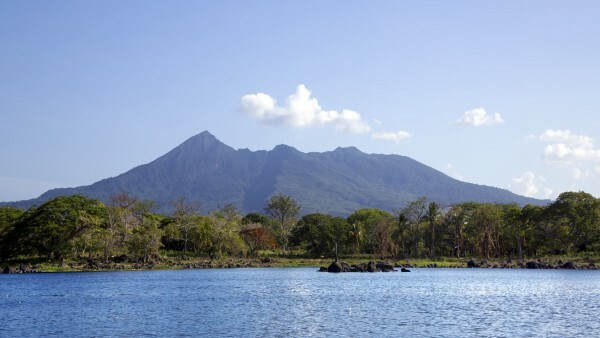 A new wastewater treatment plant saved the lake and turned it into a recreational area for Nicaragua.